X-FORCE member Brianne Thompson is the fastest female in the world! In anticipation of the 2019 USPA National Championships (in North Carolina) and the 2019 FAI World Cup of Formation and Artistic Skydiving (in Eloy), X-Force continue to regularly hit the tunnel. 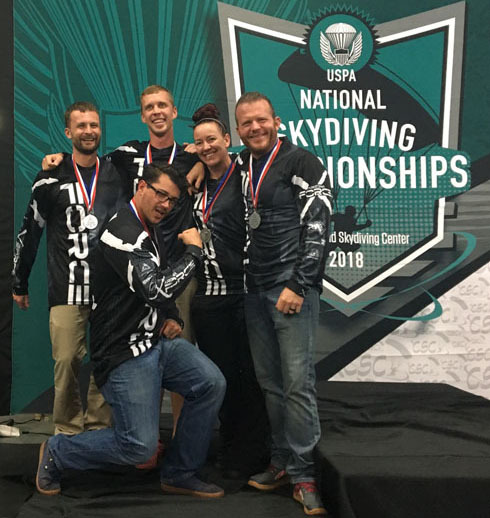 X-Force set a new team record at the 2019 US Indoor Skydiving Open National Championships when they scored their highest scoring round of 46 points. Bronze Medal for X-Force in 4-Way VFS Open! The 2019 US Indoor Skydiving Open National Championships were held at iFly Virginia Beach on January 11th – 13th. Arizona X-Force attended its first indoor competition with its current line up established early last year. Some of the same teams competed at last year's USPA Skydiving Nationals: SDC Core, Army Golden Knights, SDMW Chemtrails, and Collective Pitch. Arizona X-Force had a strong showing with two new team bests: its highest indoor average of 26.1 points over 10 rounds, and single highest scoring round of 46 points in 35 seconds. 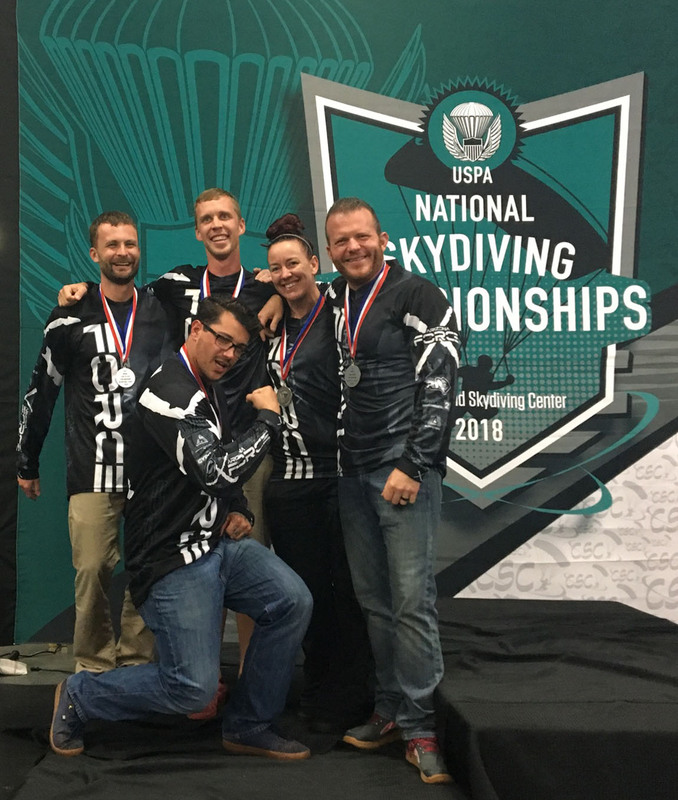 The team's next major competitions will be the USPA Skydiving Nationals in Reaford, NC at the end of September, immediately followed by the FAI Skydiving World Cup in Eloy, AZ in early October, which the team qualified for at last year's nationals. 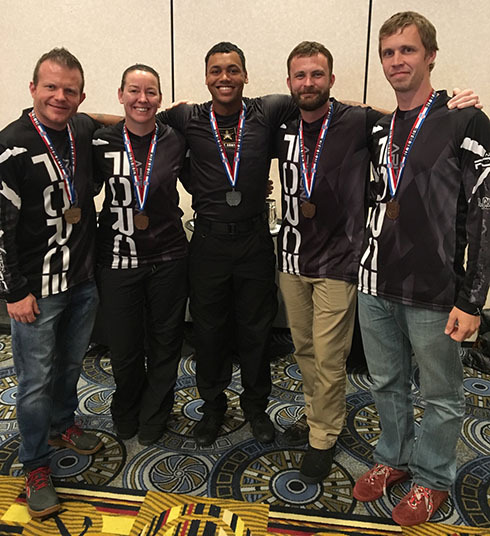 The image shows Arizona X-Force, post medal ceremony, with former team mate Isaac Hansen, who is currently on the Golden Knights Vertical Program (GKVP). From left to right: Keith Fournier, Brianne Thompson, Isaac Hansen (GKVP), Niklas Daniel, Mike Bougher. Our season recap is filled with indoor and outdoor training footage, competition, bloopers, and other various outtakes. Special thanks to all our sponsors and supporters for making our 2018 season possible. Silver Medal for X-Force in 4-Way VFS Open! During the 2018 USPA National Skydiving Championships Arizona X-Force came in second in the 4-Way VFS Open event. The vertical formation skydiving event completed five of 10 scheduled rounds, with five teams in each division. X-Force—only in their first year with the current line-up—scored an 17.8 points average, setting a new best for the team, and 22 points in their highest scoring round. SDC Core once again took the gold medal and the Golden Knights took bronze. Arizona X-Force would like to thank all of its sponsors and supporters for making a successful 2018 season possible! Arizona X-Force would also like to thank and congratulate its fellow competitors for a great competition. A special shout out to all who participated in the intermediate test event. We welcome the new devision and look forward to having increased participation. You can learn more about cookies and how to customize your browser settings at allaboutCookies.org.